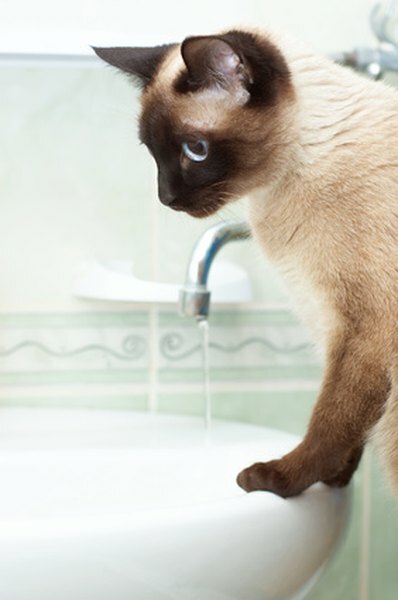 If your cat is constantly seeking out water, he may have an underlying health issue. Perhaps better known as finicky eaters, cats aren't prolific water drinkers. If your cat is drinking a lot of water, it could be a sign of a serious health issue including diabetes, kidney disease or hyperthyroidism. Monitor your cat's water intake and call a veterinarian if there's a dramatic shift. Cats don't typically drink a lot of water, but the host of factors that influence how much they drink are difficult to negotiate into authoritative rules. Unlike dogs, who can generally hydrate themselves in one sitting, it takes cats 24 hours to drink enough water to replace 6 percent of their body weight, according to the National Academies' Research Council. Cats typically drink 2 millimeters of water for every gram of dry food they eat. Cats who eat wet food typically drink less, as their fodder is at least three-quarters water. Excessive drinking can be a sign of disease or a response to environmental conditions or diet. Drastic changes in location or routine are mitigating factors, too. Consult a veterinarian if your cat suddenly begins drinking more water than usual. Excessive thirst can indicate a range of heath issues, most of which involve the kidneys and urinary tract. Dehydration typically causes concentrated urine, as your cat's body attempts to balance its hydration. If your cat is dehydrated but has dilute urine, something's seriously wrong. If your cat's ravenous thirst is accompanied by similarly excessive weight loss and urination, diabetes mellitus or kidney disease are likely culprits. Old, obese and male cats are at higher risk of the former. Genetic predisposition plays a role in the latter. Hyperthyroidism also shares overlapping symptoms. Renal failure -- i.e. kidney failure, a symptom and condition itself -- also causes excessive thirst, along with a host of health issues. A urinalysis, blood test and physical examination usually confirm diagnoses. Outcomes of health issues that cause excessive water drinking vary greatly. Feline diabetes is managed, not cured. Treatments vary depending on the stage in which they're diagnosed and may require a degree of trial and error, particularly when it comes to feeding and insulin shots. Kidney disease is irreversible and progressive. Special diets or procedures may be required. Complications may escalate, particularly in advanced cases. Hyperthyroidism can be treated with medication or surgery. Renal failure is the second most prevalent cause of feline death in the U.S., according to Dawn M. Fiedorcyzk of Misericordia University. It's typically diagnosed around age 7, but risk likely increases with age, and most cats die within three years of diagnosis. Because cats don't typically drink a lot of water, they're at higher risk for urinary tract stones, dehydration and kidney issues. Cats prefer fresh, running water, so it's important to clean and fill multiple water bowls on a daily basis. Let a tap dribble or purchase a circulating water system to entice harder-to-please cats to drink. Add water to dry kibble to whet your cat's appetite -- it's strongly related to his sense of smell -- and increase his water consumption. CatChannel.com: Why Does My Cat Drink Lots of Water?